Finding a trustworthy window company is essential when you’re planning to replace your windows. They will ensure that your windows are installed properly to reduce any air leaks. They also have access to quality materials for long-lasting performance. 1. All our contractors undergo factory training to ensure that they have the skills and knowledge needed to install your windows properly. 2. We employ locals because we believe that local contractors underst and your home better than anyone else. 3. We don’t use shortcuts when installing Chesterfield doors and windows. We custom-fit your windows and patio doors according to your needs and wants. We also follow a systematic process when installing our products. 4. We offer a wide selection of styles and customization options for both windows and patio doors. This way, you can find the right design that will go well with your home’s architectural style. 5. We are committed to constantly improving our services so we can help you build better homes. 6. Our knowledge of the window industry is extensive. We are also committed to providing quality patio doors and replacement windows in Chesterfield, MO. 7. We ensure energy savings and protection through our use of the right materials. Our windows come with durable Fibrex® frames and energy-efficient High-Performance™ Low-E4® glass packages. Our doors, on the other h and, come with high-quality wood with protective coatings and energy-efficient glass. 8. We back our products with strong manufacturer warranties. We cover the glass, frames and non-glass components, as well as installation. We cover glass for 20 years, frames and other components for 10 years, and installation for 2 years. 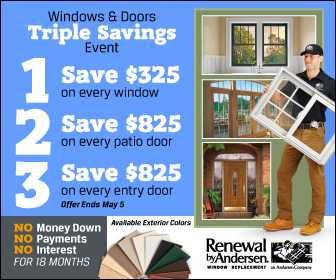 You can rely on Renewal by Andersen of St. Louis for superior customer satisfaction and quality home improvement services. We have created long-lasting relationships with our clients, resulting in positive customer feedback and recommendations. If you want to learn more about our products and services, call us at (314) 332-2364. You can also schedule a free in-home consultation when you fill out our contact form.